In 2011, Alabama Republicans used their complete control of the state government to enact a voter ID law, which required Alabama voters to present a driver’s license or some other form of photo identification to election officials in order to be able to vote. The ten Alabama counties with the highest percentage of registered non-white voters are Macon, Greene, Sumter, Lowndes, Bullock, Perry, Wilcox, Dallas, Hale, and Montgomery. Alabama has closed driver’s license offices in eight, or 80%, of those ten counties, with only Dallas and Montgomery counties not affected by the closures. In the other 57 Alabama counties, Alabama has closed driver’s license offices in 24, or 42%, of those counties. 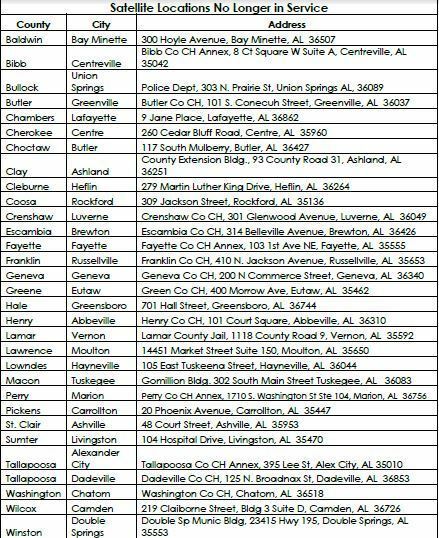 All Alabama counties where more than 75% of registered voters are black have seen driver’s license offices in those counties closed. In the 2012 presidential election, 15 of Alabama’s 67 counties voted for the Democratic ticket of President Barack Obama and Vice President Joe Biden. Alabama has closed driver’s license offices in eight of those counties, or 53% of the counties that voted for Obama. Conversely, 52 of Alabama’s 67 counties voted for the Republican ticket of presidential candidate Mitt Romney and vice-presidential candidate Paul Ryan. In those 52 counties, Alabama has closed driver’s license offices in 22, or 42%, of those counties. In the five Alabama counties that gave Obama/Biden the highest percentages of the vote (Macon, Greene, Sumter, Lowndes, and Bullock), Alabama has closed driver’s license offices in all five of those counties. In the five counties that gave Romney/Ryan the highest percentages of the vote (Blount, Winston, Cullman, Cleburne, and St. Clair), Alabama has closed driver’s license offices in only three of those counties (Winston, Cleburne, and St. Clair). In case you’re wondering which Alabama county had two driver’s license offices closed, that would be Tallapoosa County, which gave Romney/Ryan nearly 66% of the vote in the 2012 presidential election. It’s 100% clear to me that the driver’s license office closures in Alabama disproportionately affect black Alabamans, and that the Republicans who run Alabama’s state government are deliberately trying to prevent black people from voting. Jim Crow is, sadly, alive and well in Alabama.